What does PHF do with grantee and applicant feedback? The Center for Effective Philanthropy (CEP) is a not-for-profit research organisation that has conducted independent surveys for over 300 philanthropic organisations worldwide. The surveys provide a comprehensive analysis of the grant-making experience for both applicants and grantees and in doing so, provide a healthy challenge mechanism for grant-makers to reflect on practice and consider improvements. At Paul Hamlyn Foundation, we are committed to transparency and openness. Giving people a voice and stopping to listen is an important part of this. We were the first independent UK grant-maker to take up the challenge to use CEP’s surveys, giving applicants and grantees the opportunity to share their views with us in an anonymised way. Almost ten years on, we retain our long-term commitment to listen and respond to what we hear. In 2017, we commissioned our third CEP survey to give grantees and applicants the chance to speak freely about their experiences of working with us. As in the previous two surveys, there are things we are doing well and things we could be doing better. We encourage grantees and applicants to invest in evaluation of their practice in order to learn and improve. In the same spirit, we too benefit from a formal and comprehensive assessment of our performance by those best placed to judge our effectiveness. The surveys sought views from applicants who were notified that their proposals were not successful and grantees who had an active grant in the period between July 2016 and July 2017. The survey itself took place between September and October 2017 and we were grateful that such a high proportion of respondents were willing to share their views. Over 70% of grantees and around 40% of applicants responded and we have been reflecting on the wide-ranging feedback we have received. The surveys covered a number of areas, ranging from questions relating to people’s perceptions of the Foundation’s impact on their fields, perceptions of our communications and relationships with us, and our application processes. As an organisation we have been thinking about where our effort can be best spent to alleviate pressure, increase effectiveness and further understanding at every stage of the grant-making process. How have we arrived at our priorities for action? We want our actions to be meaningful, achievable and responsive. We have been keen to balance that desire to act with our capacity to do things well. Every team at PHF has been involved in offering solutions and thinking about what they can do to make things better for everybody. Trustees have reviewed the responses from grantees and applicants and asked searching questions of our independent researchers and staff. Our Evidence and Learning Advisory Group have brought independent scrutiny and challenge to our discussions and have helped us to think about whether our actions go far enough. We value the input from all those that have engaged with the process. The following three interconnected areas have been identified for action starting this year. They do not represent everything we will do but put forward the key areas that we are prioritising for action as a response to the survey findings. We value relationships at Paul Hamlyn Foundation. Paying attention to the quality of interactions with grantees and applicants will be a continued focus for us. We will maximise opportunities for feedback and think about new ways that people applying to us can ask questions. This could include regular webinars for example. We will review how clear our offer is to grantees about what to expect from a relationship with us and will look for ways to offer and receive feedback about the strength of that relationship. With over 1000 grant requests per year, we regrettably have to say ‘no’ more than we can say ‘yes’. Yet we have heard that we need to use this opportunity to provide better information to applicants about why a grant request has been declined. We will aim to give more informative declinations which can be useful to applicants in the future. We already share our thinking with applicants in a way that is proportionate to the stage of application, conveying more detail about why a request for funding has been unsuccessful if an applicant is at further stage of the grant-making process. We will publish the main reasons for declinations to further transparency and to help guide and shape requests for funding. We have made a number of changes since 2015 to improve the grant-making process under the current strategy. For example, changing the questions on application forms and refining guidance for applicants. However, we have heard that our grant-making processes may not always be clear and we will be thinking about what we can do to make the process of applying easier. We will review how we communicate our criteria for eligibility and assessment and make clearer the steps that PHF goes through in assessing and approving applications. We hope this will help to reduce the time applicants spend on applying, increase transparency and make the grant-making process more effective for everyone. We will also look at how best to keep applicants informed of the movement of an application to the next stage and consider the value of early stage conversations with applicants to help further understanding of the nature of the grant-making process ahead. We had already made a commitment to start to act upon the survey’s key findings as part of our business planning process for this year, and we are now looking forward to making these improvements. The business plan will be the vehicle through which progress will be monitored and reviewed on a quarterly and annual basis. Alongside this internal focus, our governance structures and advisory groups will continue to hold us to account. We rely on our Trustees, independent advisors, staff, grantees and applicants to continue to help us to respond appropriately to what we have heard. We invite you to review the detail of the survey findings. If you have any views please contact evaluation@phf.org.uk. 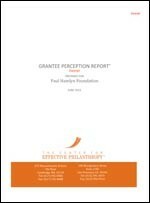 Summary findings from the Grantee Perception and Applicant Perception Reports, conducted by the Center for Effective Philanthropy in 2013.